Recipe Copyright © 1997 & 2005 Kasma Loha-unchit. See Kasma's Blog on Kabocha Squash. This recipe is also called, in Thai, Gkaeng Liang Gkati Fak Tong. This is an updated version of this recipe, which originally appeared on this site in 2000. Here's the original version of the recipe. 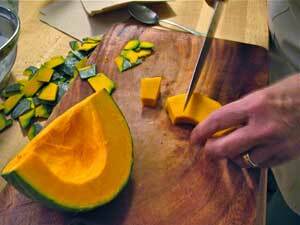 Cut the kabocha squash or pumpkin in half, scoop out the seeds and strings, peel and discard the tough outer skin. Cut into 1 to 1 1/2-inch cubes (should yield about 5 to 6 cups). Sprinkle and coat the pieces with lime juice and set aside. Shell the shrimp and place in a blender or food processor with the chopped peppers, shallots, shrimp paste and 1/2 cup of water. Puree into a smooth, well-blended mixture. Reserve two cups of the thickest cream from the top of the 2 cans of coconut milk. Set aside. 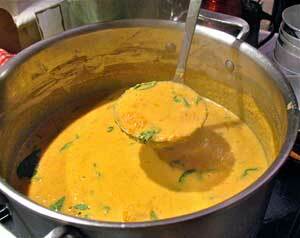 Pour the remaining lighter milk, along with the remaining 1 cup of water into a medium-size soup pot. Stir in the pureed shrimp mixture and mix well to dissolve the paste in the liquid, smoothing out any lumps. Bring the soup mixture to a boil over medium heat, stirring to a smooth consistency. Add the kabocha squash or pumpkin chunks. Return to a boil and simmer over low to medium heat until the squash is soft and tender (20 to 30 minutes, depending on the squash). Do not be concerned at this point with the appearance of the soup as it will change considerably with the addition of the coconut cream. Add the reserved coconut cream* and bring to a boil over medium heat. Season with fish sauce to the desired saltiness. The squash should impart a lovely golden color to the soup. 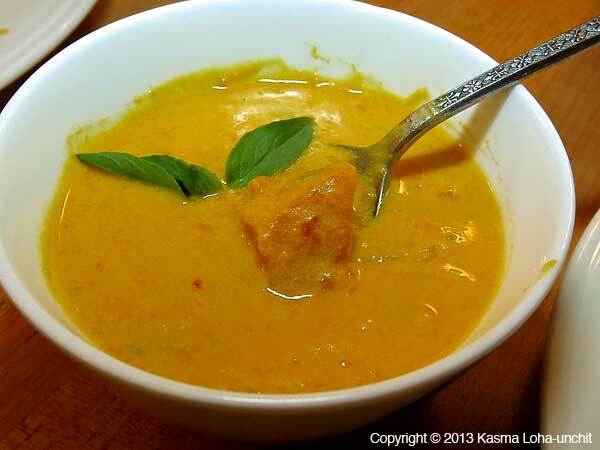 If it is not sufficiently ripe to sweeten the soup, add palm sugar to sweeten to your liking. Simmer a couple of minutes to allow the flavors to blend. Stir in the lemon basil or lemon mint (or Thai basil) and when they have wilted, turn off heat. Serve warm, garnishing the top of each bowl with a sprig of lemon basil, lemon mint or Thai basil. * Adding the coconut cream near the end of cooking ensures a smoother, creamier soup and minimizes the likelihood of the cream curdling. Coconut cream, particularly from canned coconut milk, will tend to curdle if boiled with water for too long or over too high a heat. The squash I grew up knowing as "pumpkin" is a much different variety from the bright orange ones that are carved and decorated as jack-o'-lanterns for Halloween. Smaller, flatter and more disc-shaped, its mottled dark green peel turns to a dull greyish green, tinged with spots of yellow and light orange as it ripens. Inside, the flesh is a vibrant golden yellow, hence we call it "golden squash." 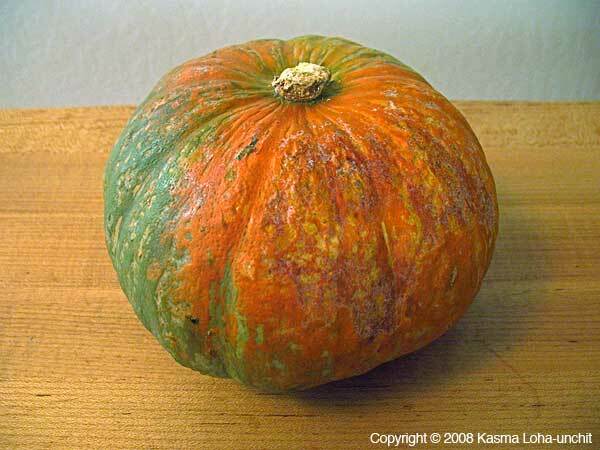 Relatives to the golden squashes of home are the kabocha and the kalabasa. Tasty and sweet, both these varieties revive recollections of my favorite flavors from childhood. Brought to us here by Japanese American farmers, the kabocha (meaning "little pumpkin") is now widely available not only in Asian markets, but in supermarkets and neighborhood grocery stores as well. It is prized by Southeast Asian immigrants as can be seen by its availability in most of their markets, to the exclusion of other "pumpkins." Kalabasa, on the other hand, is only beginning to become popular and its availability is still limited. Besides desserts and sweet treats (see sangkaya), we use golden squashes in different stages of ripeness for a wide variety of dishes, including soups, salads, appetizers, pickles, vegetable courses and curries. For a delicious pumpkin soup, use a ripe kabocha squash - one with peel that has turned a light greyish green, splashed with splotches of yellow and orange. But it shouldn't be so old that it has dried out. Pick one with a good weight for its size. If the squash is under-ripe (i.e., still deep green in color), use a natural sweetener such as palm or coconut sugar to help bring its nutty flavor through the coconut milk. A green kabocha squash will ripen when stored in a well ventilated area for several weeks, or even a few months, so I always have one on hand. It is pretty to look at in the hanging basket in my kitchen. If you are not able to find kabocha, substitute with a good variety of winter squash that has a sweet and buttery flavor. Kasma teaches this recipe in the Evening Series Advanced Set B-4. *Because the Thai language has its own script, there are different ways of transliterating Thai into English. The more phonetic version is Gkaeng Liang Fak Tong; the more usual spelling is Kaeng Liang Fak Tong. See A Note on Thai Pronunciation and Spelling. Recipe Copyright © 1997 & 2005 Kasma Loha-unchit. All rights reserved.